Biology Parasitoids or phytophages (gall formers and inquilines). Benoit, P.L.G. 1955. Les Liopteridae Oberthurellinae du Congo Belge. Revue de Zoologie et de Botanique Africaines 52: 283–293. Benoit, P.L.G. 1956. Liopteridae-Mesocynipinae nouveaux du Congo Belge (Hym.-Cynipoidea). Revue de Zoologie et de Botanique Africaines 53: 51-56. Buffington, M.L. & van Noort, S. 2012. Revision of the Afrotropical Oberthuerellinae (Cynipoidea: Liopteridae). Zookeys 202: 1-154. Liu, Z, Ronquist, F. & Nordlander, G. 2007. 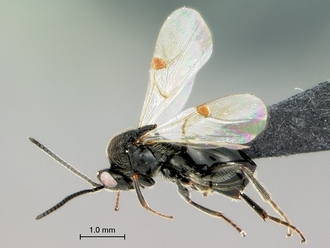 The cynipoid genus Paramblynotus: revision, phylogeny, and historical biogeography (Hymenoptera, Liopteridae). Bulletin of the American Museum of Natural History 304: 1-151. Quinlan, J. 1979. A revisionary classification of the Cynipoidea (Hymenoptera) of the Ethiopian Zoogeographical Region. Aspicerinae (Figitidae) and Oberthuerellinae (Liopteridae). Bulletin of the British Museum of Natural History (Entomology) 39: 85-133. Ritchie, A.J. 1993. Superfamily Cynipoidea (pp. 521-536). In GOULET, H. & HUBER, J. (eds). Hymenoptera of the World: an identification guide to families. Research Branch, Agriculture Canada, Ottawa, Canada, 668 pp. Ronquist, F. 1995. Phylogeny and classification of the Liopteridae, an archaic group of cynipoid wasps (Hymenoptera). Entomologica Scandinavica Supplement 46: 1-74. Ronquist, F. 1999. Phylogeny, classification and evolution of the Cynipoidea. Zoologica Scripta 28:139–164. van Noort, S. & Buffington, M.L. 2013. Revision of the Afrotropical Mayrellinae (Cynipoidea, Liopteridae), with the first record of Paramblynotus from Madagascar. Journal of Hymenoptera Research 31: 1-64.